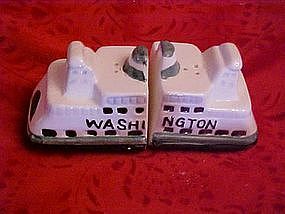 Nice size salt and pepper shakers. Two pieces fit together to make the ship. Measures 2 1/2" tall, and 5 1/2" long. Has plastic stoppers. Hand painted ceramic, great condition.